Spotify’s RapCaviar selects 3 of its breakthrough artists to stand among the icons of history and culture. Photo of SZA: RCA. Photo of 21 Savage: Ben Grieme, from his FADER cover shoot. 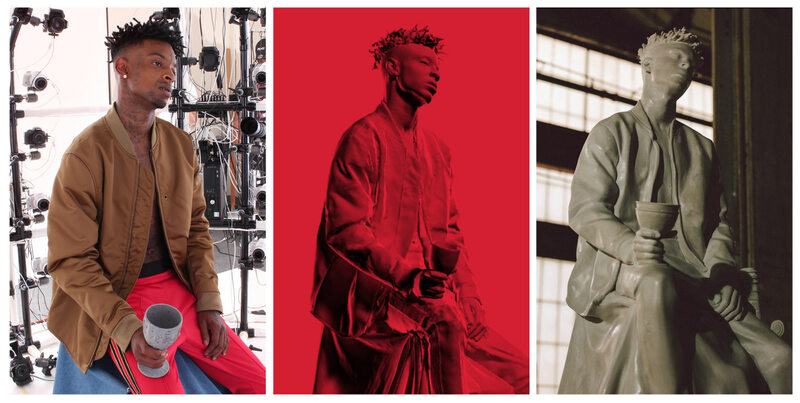 Photo of Metro Boomin': Gunner Stahl, from his FADER cover shoot. 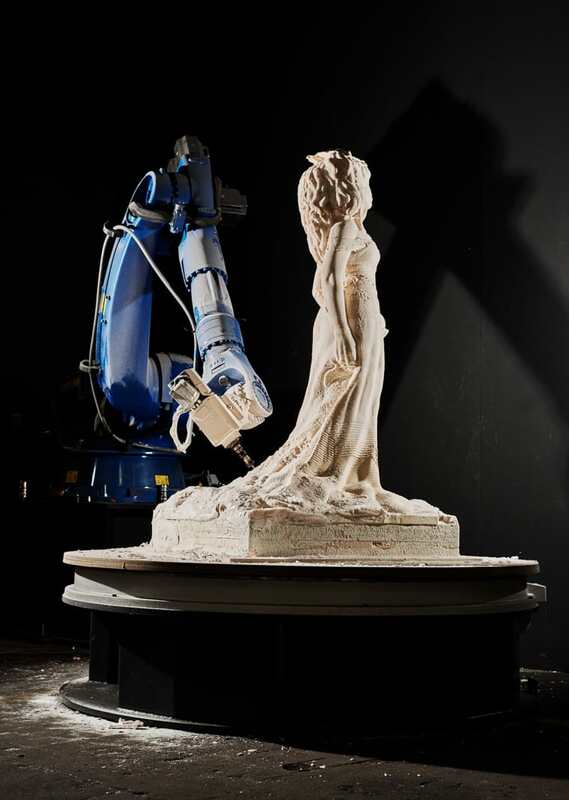 Sculpture photography: Driely S.
Somewhere on the production floor of a downtown Brooklyn warehouse, in between pillars of exposed steel and a trio of cobalt blue robotic arms, SZA is becoming immortal. 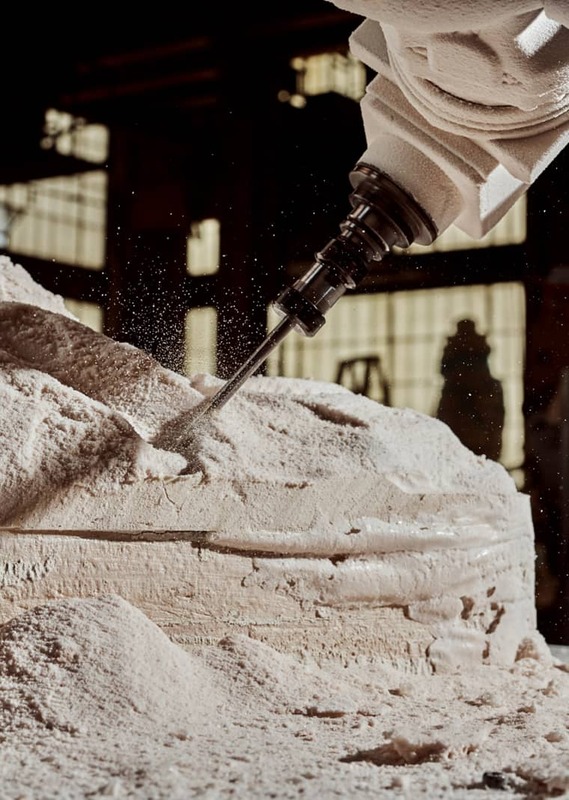 Again and again, one of the arms swoops around a block of raw material, carving away layers until a life-size human form begins to emerge out of the blankness. It's her hair that strikes you first. SZA's epic curls have always been an equal match for her fierceness, but when solidified like this, the impact is legitimately titanic. She looks like a goddess. 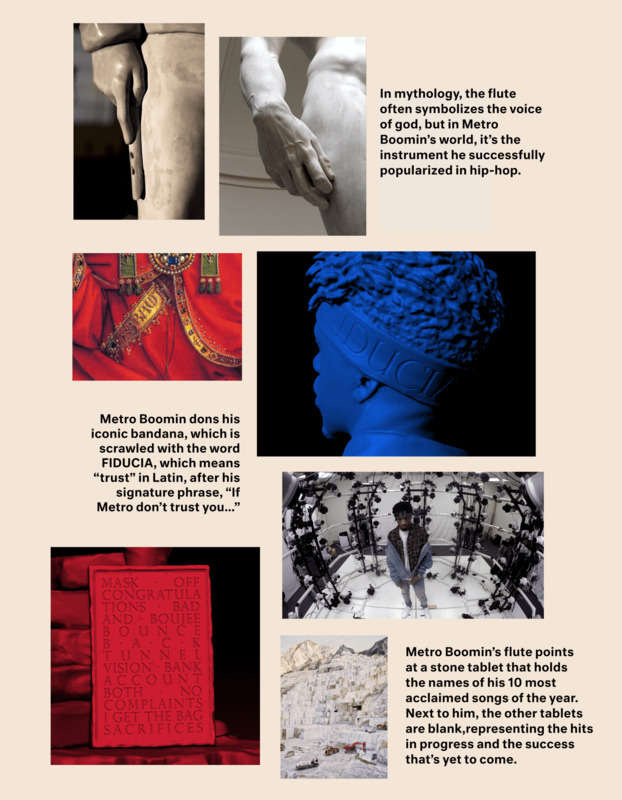 Just around the corner, a matching life-sized statue of Metro Boomin stands fixed in eternal observation mode. The young producer has been captured in a pose that sees him looking intently into the distance, forever sizing up the track . At his feet sits a list of his world-conquering megahits, looking like the first commandments of a new creator. And then there's 21 Savage: sword at his side, double chalice in hand, he is restless even on the throne. Surrounded by the millions in his bank account. Eternally hungry for more. 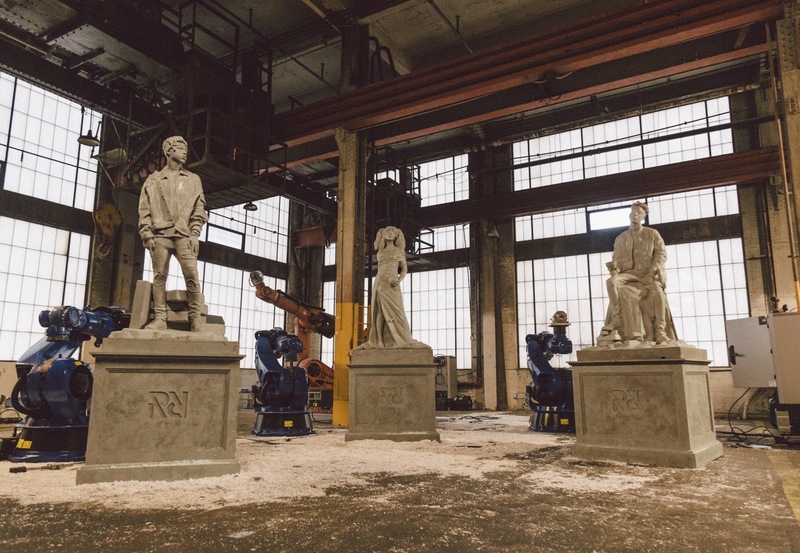 The three sculptures are the inaugural members of the RapCaviar Pantheon, a manifestation of the Spotify playlist that has grown to become the rap world’s closest thing to a unified scene. RapCaviar simultaneously represents the absolute pinnacle of the mainstream (with placement in its ranks defining mass success) and the essence of its modern underground, with its consistent championing of young, boundary-pushing artists and next level sonics. It’s a wild combination only possible in the brave new world of streaming. And yet it has little to do with cutting-edge tech — RapCaviar today is instead the passionate responsibility of one person: Spotify Global Head of Hip-Hop Tuma Basa, who, along with his team, personally selects every song added to the playlist. Maybe that human element is what led RapCaviar to this endeavor. Born from a desire to celebrate three of the playlist's biggest breakthrough artists of 2017, the RapCaviar Pantheon is Spotify's way of loudly and personally voting for the timelessness of SZA, Metro Boomin, and 21 Savage — and an invitation for these artists to take their place alongside the iconic figures of history. Photo of Michaelangelo and Ludovisi Ares: Getty Images. Sculpture photography: Driely S.
Her singular voice made her an R&B star who broke rap’s biggest playlist—on her own terms. SZA changed the rules of the game without ever compromising herself in the process. SZA 3D Render, upper left: Jay Harwood. 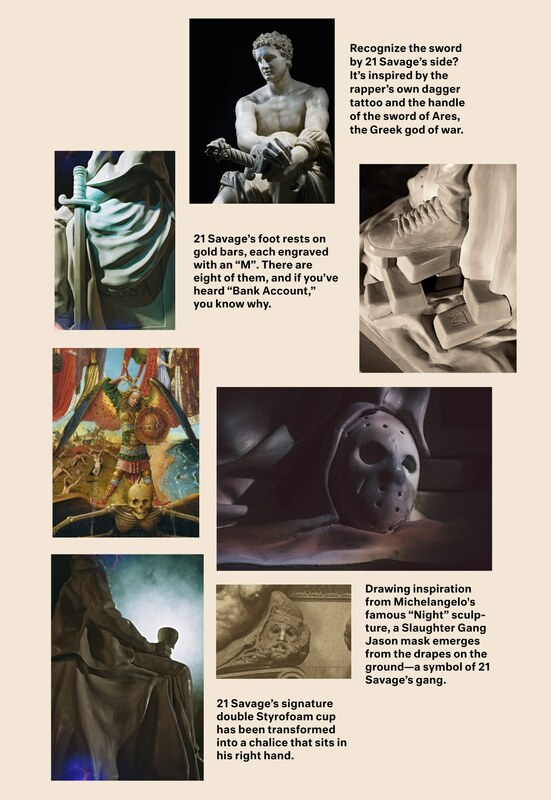 Photo of SZA sculpture, upper right: Driely S. Photo of sculpture detail, lower right: Mario Kristian. 21 Savage clawed his way ahead to the top without turning his back on his past. As he became one of the fastest rising artists of the year, he used his rough background to make lyrical poetry that resonated across the country. Photo of Ludovisi Ares: Getty Images. Photo of Michaelangelo's tomb: The J. Paul Getty Museum, Los Angeles. With his name overwhelmingly adorning the biggest tracks of the year, young Metro wrote the blueprint for the sound of 2017 — and showed a new generation how to build an empire from deep inside the studio. Metro Boomin 3D Render: Jay Harwood. 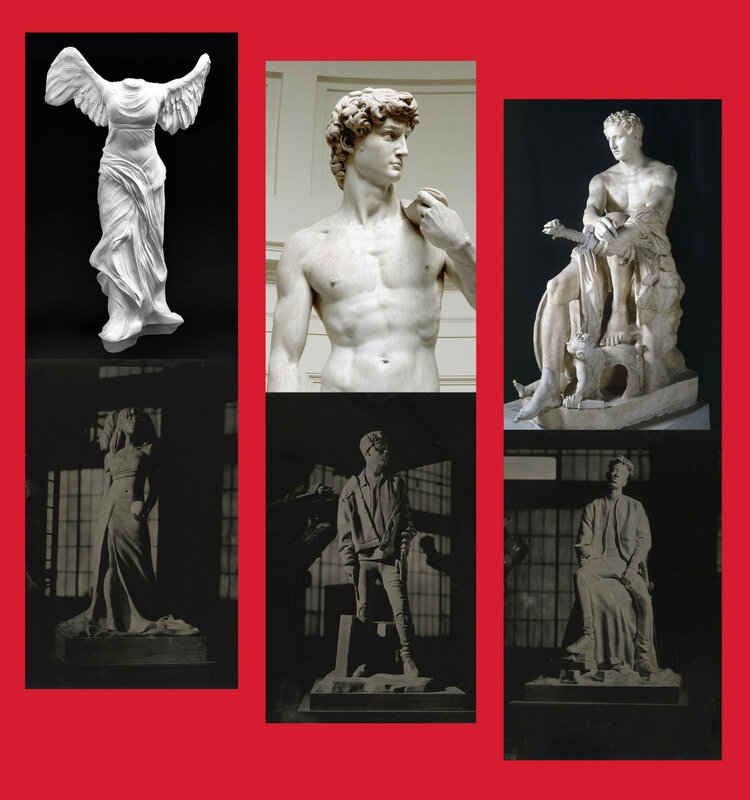 Photo of Michaelangelo and Carrera Marble: Getty Images. Photo of Michaelangelo's signature courtesy of Saint Peter's Basilica. A Director X created short film features Pharrell — a timeless rap icon if there ever was one — welcoming SZA, Metro and 21 to the pantheon. Lists of dominant artists are nothing new around this time of year. But seeing SZA, Metro, and 21 immortalized in sculpture does more than just glorify their achievements. Its a celebration of what we value in our culture - and what we think should last. Metro Boomin's incredible talent and humility led him to shape the sound of damn near his entire generation. 21 Savage transformed a lifetime of struggle into a vehicle for escape, without ever compromising his truth. SZA won over millions while sounding like absolutely no one else. Their features on RapCaviar helped solidify them in culture. Now RapCaviar is solidifying them in time. Next year, they'll be new playlists, new artists, and new additions to the pantheon. But SZA, Metro Boomin, and 21 Savage will always be forever. Trust.